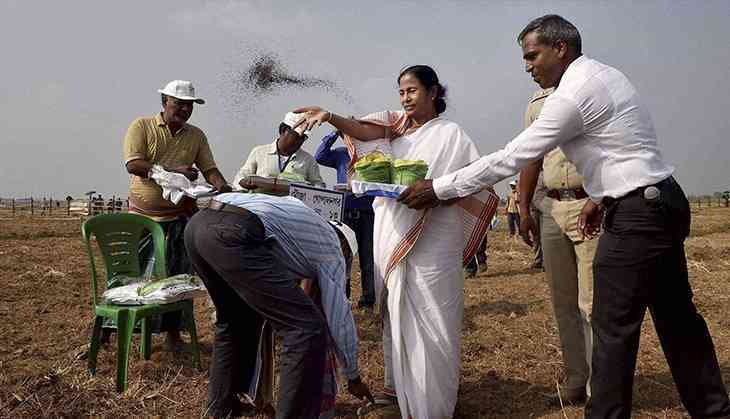 Keeping an eye on the Panchayat elections scheduled in 2018, West Bengal chief minister Mamata Banerjee on Monday announced that farmers in the state will be exempted from paying tax for possessing farmland. According to Pradip Majumder, an agricultural scientist with the West Bengal government, “Till now, no state has exempted farmers from paying tax for possessing farmland. West Bengal government is safeguarding the interests of farmers at a crucial time”. Officials say that the move is aimed at giving relief to the farmers as it was found that after demonetisation, they have been finding it difficult to pay taxes. According to them, over the past two years, around 36 farmers have committed suicide in the state due to drought, therefore such a measure was necessary to provide them relief. West Bengal agriculture minister Purnendu Bose said “We do not want a famine like situation to occur in West Bengal therefore our chief minister has taken such an effort to provide relief to farmers”. The West Bengal government's move may also be seen as a contrast to the alleged attempts of the Centre to bring farmers under the tax net. Accusing the Narendra Modi-led central government of not helping farmers, Banerjee said “The Centre has cut funds in all schemes and I urge banks to be compassionate with farmers who apply for loans”. Banerjee claimed that instead of helping states, the Modi government has been pumping money into social media groups who circulate fake news items. It seems her reference was the to propaganda campaign by BJP and RSS that West Bengal had become a den for Jihadi activities.